Rock & Roll Hall of Fame - The Rogers Co. The Rogers Company worked with The Rock & Roll Hall of Fame and the design firm Pentagram to create an exciting tribute to the past 50 years of Rolling Stone Magazine's history. There were a couple design challenges we had to address before we could start the process. The entire exhibit needed to be modular so it could be easily installed and dismantled to travel around the country, and it needed to be small enough to fit into a standard elevator or be taken by hand up escalators or stairs. The exhibit starts with a replication of the original San Francisco office used by Jann Wenner, who was the founder/editor. All of the textures, finishes, and graphics were printed directly onto raw birch plywood prior to construction. Each printed piece of plywood was then cut and used to construct wall panels and appliques. A tremendous amount of coordination was required to ensure that all of the seaming aligned on the wood plank floors, the white brick walls, and graphics that tell the story. The middle floor was designed as multiple vignettes to display all the artifacts that were specially procured for the fifth floor. Again, all of the walls, beams, and graphics were printed onto raw birch. 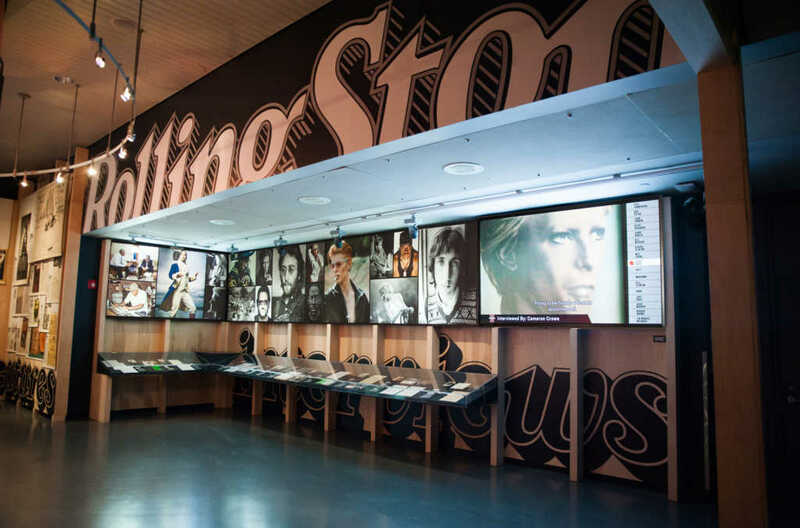 This floor required the integration of various types of media and showcases that secured artifacts from Rolling Stone’s history. 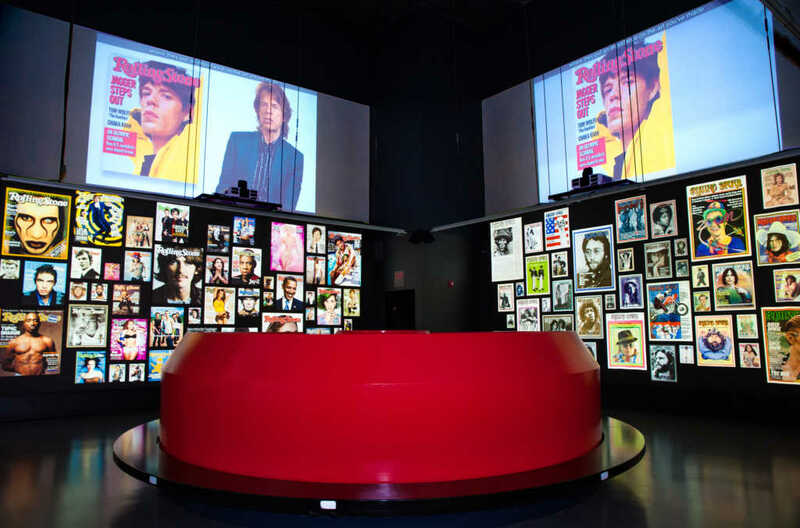 To top off the last part of the journey, the sixth floor has four massive 12’ x 24’ back-lit LED lightboxes that display an eye-catching montage of magazine covers over the past 50 years. The back-lighting creates a vibrant look that really makes all the covers stand out and pop off the fabric. The entire project was built in approximately five weeks and was set up by six people in four days. This was crafted as a truly modular exhibit, allowing it to be transported and then displayed at other venues throughout the country.